DeltaMaker reached its funding goal of $107,000 and surpassed it within the first few days of launching the project on Kickstarter. So what does this mean for the 3D printer? Since DeltaMaker has reached its goal and raised the necessary funds, the creators are now able to move the project to the next phase; production. But, with just over two weeks left in the printer’s Kickstarter campaign, the DeltaMaker creators plan to make a grand exit and put DeltaMaker on the map. 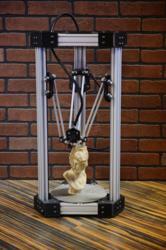 Why has this particular 3D printer gained so much popularity? It’s simple: DeltaMaker’s clean and elegant feel positions the 3D printer as an entertainment piece, fit for desktops, classrooms, living rooms, waiting rooms and more. Gone are the days where 3D printers are created for industrial spaces, spitting out prints somewhere in a back room. So how exactly does a 3D printer work? Making objects is usually a subtractive process, meaning an object is created by starting with a block of material and carving around it until the final object has been created. However, 3D printing is an additive process in that it lays down successive layers of filament until the desired object has been created. 3D printing has come a long way since it was first developed in the mid 1980s and the technology is now used in jewelry, footwear, industrial design, architecture, engineering, construction, automotive, aerospace, medical industries, education, geographic information systems and many other fields.